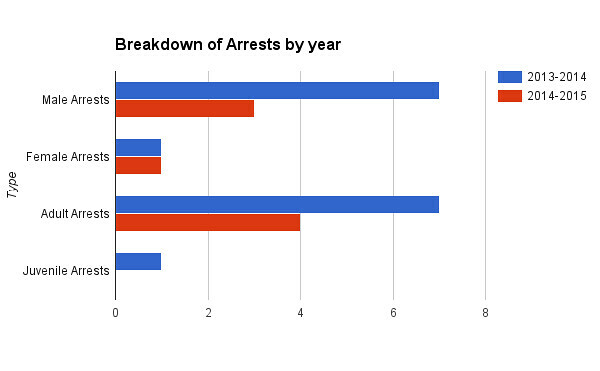 This graph breaks down the profile of arrested students by gender and age with data from the NCPD. The blue line represented the 2013-2014 school year. The red represents the 2014-2015 school year. With eight unsolved thefts, two student arrests, and one banned person this semester, some are left to wonder whether the biggest culprit might be the community itself. On Aug. 22, a student was arrested on-campus for possession of less than 20 grams of marijuana, possession of narcotics equipment, and possession of two other unidentifiable substances that, according to Chief of Police Michael Kessie, were later revealed to be Lysergic acid diethylamide, commonly known as LSD, and Psilocybin mushrooms, commonly known as ‘shrooms. Earlier this month, Carlos Marcio Ramirez, a guest of a student on campus, was given a No Trespass Order (NTO) for posting fliers around the school that alluded to sexual assault and for sending private, threatening messages to several students. A string of thefts has also plagued this semester. Among the missing items are two laptops taken from the Jane Bancroft Cook Library and two bicycles. According to Dean of Student Affairs Tracy Murry and Chief Kessie, there are no leads for any of the reported thefts. At the end of the semester, on Nov. 19, second-year Carl Romer, formerly known as Carl Polak, was arrested for possession with intent to sell of less than 20 grams of cannabis and LSD. Additional substances were obtained to be identified after lab tests and added to his charge. While the arrest on Aug. 22 was due to a report by a member of administration, Campus Life Coordinator (CLC) Meghan Walde, Romer’s arrest came about after a former roommate gave a tip to campus police. New College police officer Dale Stephenson signed an affidavit after receiving information from National Student Exchange (NSE) student, David Duffrin. According to Chief Kessie, protection of Duffrin has been turned over to Student Affairs. Students worry that the events this semester will take a toll on the openness and sense of community on campus. Some students are also concerned about how this will affect administration’s treatment of substance usage on campus. However, others remain hopeful that campus community is still alive and well. Following Romer’s arrest, second-year Rebecca “Becca” Caccavo started a petition in support of allowing Romer to finish the rest of the semester. More than 900 people have signed. Caccavo also created a gofundme – “The Free Romer Fund” – on Nov. 20, which has raised over $2,000. Both the petition and gofundme have received support from students, alums and parents.